Peter's creative compositions and stylings provide the beautiful soundtrack for this website. A guitar player since the age of 14, Peter Carlozzi plays a Hopkins Monarch Regal 18, and currently resides in the San Francisco Bay Area. His feelings about his Hopkins Guitar? "I consider my Hopkins guitar the best instrument I'ver ever owned, and an inseperable part of my creative life..."
Born in Scotland, Colin moved to Australia then found fame as the frontman and distinctive voice of the group "Men at Work", who became popular worldwide. He now enjoys a busy solo career in Los Angeles and has just released "Are You Lookin' At Me? ", the latest in a growing list of CD's. Colin plays his new 18" Sunburst Marquis on this CD. His Hopkins Guitar inspired this email: "So beautiful, gets better every day, I keep discovering new things about it. It plays beautifully and contains many songs waiting to pop out." 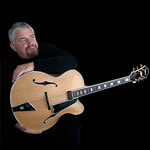 A jazz guitarist and composer for over fourty years, Steven O'Connor resides in San Diego, and has a long list of impressive musical contributions to film, television, media projects and performances. 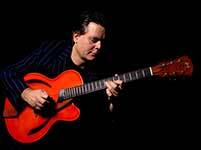 His CD "Stream Trios/Duos" is described as "rich, dark and creamy jazz guitar". His Contessa seems to have awakened a creative muse for Steven. 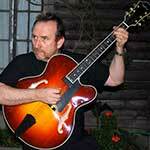 . .
"I have been a jazz guitarist for over forty years. I just purchased a Contessa from Buffalo Brothers Guitars in North County, San Diego. At first, I was put off by the "plain-ness of the finish and the lack of bindings. Not your issue, mine. Old habits, I guess. As I played it at home, it grew. So much that now I think I could put it in a planter and it would grow roots. This is the most organic guitar I have ever played. I thought my 'muse' had left me, but now it's back, in the form of the Contessa. I have barely put it down since I purchased it. I'm 62. Sometimes I look at it and it looks like a Japanese primitive instrument. Other times it looks like one of the fine violins played by the great studio players I've worked with. I'm sure this is just the beginning of a new relationship, an old relationship. Thank you, If I record anything with this beauty I will send you a copy, in hopes you may see how I interact with YOUR creation." Paul McCallum's musical journey started with the trumpet in a military school marching band when he was eight years old. He took up the guitar a few years later and has been obsessed with all things stringed ever since. His passion for jazz began after hearing Joe Pass play in the 70’s and he's wanted that sound ever since. He attended music school for two years but then gave up the guitar for twenty years. 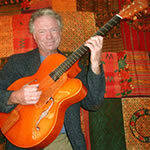 He returned to music in 2006, delving into the bluegrass world after hearing Tony Rice play. Paul took up bluegrass guitar, mandolin, and dobro, winning first place in both advanced mandolin at the 2010 Topanga Fiddle Contest and first place Finger style Guitar in 2008 in addition to recording a bluegrass CD titled, Wine Wine Wine. www.bowriverwoods.com - Bow River Specialty Woods - tone and maple woods for instruments. www.highmountaintonewood.com - superior quality spruce tonewoods and guitar building accessories. www.thedreamcafe.ca - just the funky-est intimate club where many of the continent's most talented musicians ask to return to because they love the ambiance and the enthusiasm of the audience.